Succulents of Euphorbia mayuranathanii (6,5) species are approx. 2010 let old and are planted in 6,5 cm pots. 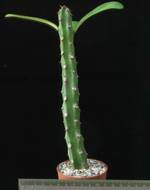 Euphorbia mayuranathanii (6,5) was raised in our greenhouse with optimal conditions. It is available for only 8.00 €!